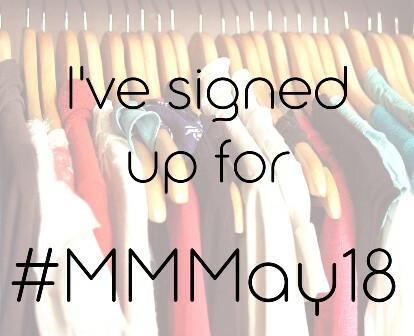 MMMay 18 stands for Me Made May and is a personal challenge for anyone who makes their own clothing or accessories to wear those items for the month of May. Zoe from So Zo What Do You Know created this challenge and it is now in its 9th year! If participants want to they can share what they are wearing each day on social media but this is not compulsory. It is open to anyone who makes things so the challenge isn’t just restricted to those who sew, knitters, crocheters, jewelry makers anyone makes things you can wear can join in the challenge. Over the last few years I have been seeing people on Instagram post photos of what they are wearing. I have decided this year to sign up to the challenge. It is really easy to sign up all you do is click on the Sign Up post and follow the instructions to copy in the comments section of the post your sign up pledge. There are no set rules of what you must pledge so there is no obligation to wear an entire outfit of Me Made each day or wear an entirely different item for each day of the month. I have thought about my situation and have set myself the challenge of wearing one me made item to work each day in May. Some days I might have more than one item on, some weeks it may be the same item worn on 3 different days. Between the items I have sewn, knitted and crocheted I think this year I have enough items to participate. This is a no stress challenge and if by chance for whatever reason one day I can’t wear Me Made I’m not going to beat myself up about it, it is more about aiming to wear the items that I have put love into making and feeling good about them. If you are interesting in setting yourself this fun challenge go check out Zoe’s blog and sign up.